Theatre credits include: TimeLine Theatre’s The Last Wife (US Premiere), the critically acclaimed Chicago premiere; Sunset Baby(Equity Jeff nomination-Best Actress, Black Excellence Awards nomination, Black Theatre Alliance Award-Best Actress); and Pulse Theatre’s Fabulations, or the Re-education of Undine Barnes(Black Theatre Alliance nomination-Best Ensemble). 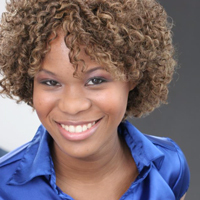 She originated the role of Regina “G” Whitnall in TimeLine Theatre’s To Catch A Fish, and was in American Theatre Company’s docudrama of The Project(s)(Black Theatre Alliance Award-Best Ensemble), and more. TV/Film credits: The Chi (Showtime), Empire(FOX), Chicago PD(NBC), and Home for the Weekendpilot (Comedy Central). Hope springs eternal.